JEE Main 2019 Application Form (April) Correction has been started from 11 March 2019. As per earlier decisions, the JEE Main examination will be conducted by NTA twice a year. The first attempt was conducted in January 2019 and the second attempt will be held from 07 – 12 April 2019. Admission Notification along with information brochure is published by NTA. Also, now it has been mandatory for all the aspirants to have a valid Aadhaar card. The 12 digit identification number (Aadhar No.) issued by UIDAI, is not mandatory for applying for JEE Main 2019. Download the JEE Main Information Booklet here. (PDF link is given below). The last date to fill the online application form will be on 07 March 2019 and last day to pay the fees will be 08 March 2019. You can calculate your rank from JEE percentile. Information Bulletin (For the first attempt in January 2019) is published and linked here. 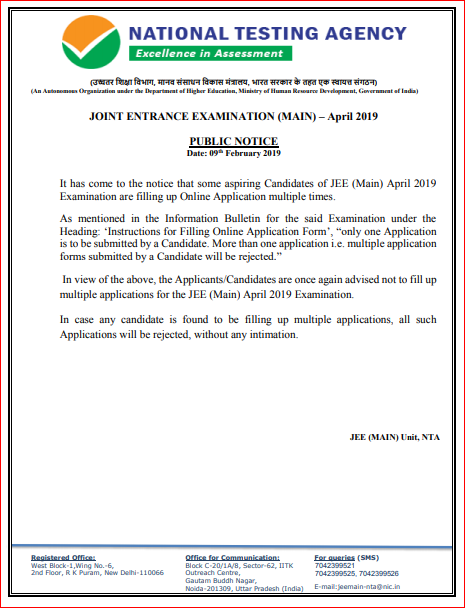 Detailed Information Bulletin for the second attempt in April 2019 has been uploaded on the JEE Main website on 08 February 2019. The photograph uploaded by the candidates without Name and Date is accepted. How to Fill the JEE Main April Exam Application Form Online? How to check the status of the Application Fee? Download JEE Main Application Format pdf Here. Keep Watching this page for Jee Main 2019 updates and latest information. JEE Main 2019 Category Correction can be done from 15 – 17 April 2019 through login. Check here for correction details. JEE Main 2019 Application Form (April) Correction has been started from 11 March 2019. Candidates can fill the choice centres till 15 March 2019. The exam conducting authority released security tips to secure the exam login. The last date to submit the application form is 07 March 2019.. Following are steps to fill the online application form for Joint Entrance Examination (Main) April Session. The application process is very simple for jee main application form. First of all, candidates need to register online and follow the registration process. Also, Candidates need the Aadhaar Card Number (Not Mandatory) for JEE Main Registration. However, the applicants who don’t have Aadhaar Number and have enrolled for the same can provide the Aadhaar acknowledgement Number. Moreover, the candidates can get the Aadhaar registration number from authorized facilitation centres if they are unable to access the Adhaar enrollment facility. Also, the above-mentioned provision is applicable to all the candidates except Candidates from J&K, Meghalaya, and Assam. Further, candidates from J&K, Meghalaya, and Assam may enter their Bank account number, passport number, ration card no. or any other valid Govt ID proof if they opted for exam city in these states only. However, PIO and OCI candidates can provide their Passport Number. Thumb impression need not be uploaded. Moreover, SBI Buddy Wallet and PayTM can be used to pay the application fee. Also, e-challan of only HDFC/Syndicate/Canara/ICICI bank can be used to pay the fee offline. Download NTA-JEE Advertisement PDF here. Print Confirmation Page of Online Application Form from NTA’s website after payment of fees. NTA released a public notice regarding Duplicate Application Form Submitted by Students. Candidates should go through the instructions (NTA JEE Main Information Bulletin PDF) carefully before they start to fill up the application form of JEE Main 2019. Accordingly, it’s better to read the information bulletin for JEE Main before proceeding with application form filling. Further, candidates must ensure that they meet all the eligibility requirements before filling the application form. Also, applicants need to submit their Aadhaar Number, Name, DOB and Gender for registration. It is informed that Candidates who will not bring these will not be allowed to sit in the examination and shall lead to his/her disqualification. Hence, the candidates are advised to check this website and newspaper regularly to know the appointed dates for the corrections or making modifications in the application form for JEE Main 2018. 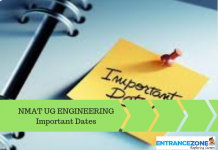 Go through the article to get a complete idea regarding the important dates for filling up the JEE Main 2019 Application Form. Candidate must ensure that e-mail address and Mobile No. provided in the Online Application Form are his/her own as all information/ communication will be sent by NTA through e-mail one-mail address or SMS on given Mobile No. only. The candidates are advised to retain the same mobile number and e-mail-id in use which they have furnished in the application form because the important information may be given to the candidates through SMS or e-mail. Candidate himself/herself shall be held responsible for non-receipt of latest information/ communication due to the wrong e-mail address and Mobile No. provided in the Online Application Form. Online Application Form Submission must be done by accessing NTA website www.jeemain.nic.in only. Firstly, Aadhaar is a compulsory requirement for filling the JEE Main 2018 Application Form. Then, the candidates should read the JEE Main information bulletin properly. And, eligibility criteria should be checked prior to filing the online application for JEE Main 2018. Further, Only one application form from a candidate is acceptable. If any candidate tries to do otherwise, his or her application will be immediately cancelled. Also, the details required to be filled in JEE Main 2019 application form must be checked properly before submission. No editing can be possible after the payment of the application fee. However, some important particulars can be corrected during a specified time period allotted by the exam authorities. But candidates should keep in mind that this provision is not applicable to all the details entered. Candidate should exercise utmost precaution while filling the JEE Main 2018 Application Form. In the case of any difficulty, the candidates can contact the facilitation centres authorized by the board. Finally, the list of facilitation centre is available online as well as in the information bulletin. And, the assistance is free for all the candidates. What is the required procedure to fill the JEE Main Application Form 2019 and How to fill the JEE Main Online Application Form? The Essential Requirements Before Online Registration are given below. Recent B/W Passport Size Photograph. The photograph must have the candidate’s name and date on it. Also, Candidates should keep the details of the qualifying exam (XIIth) handy. Also, applicants should be ready with the debit/credit card details or e-challan details. While registering, candidates should choose a password according to the specified rules. And, the password must contain the 8-13 character, at least one upper and lower case, the numeric value and special character must be there. Finally, Choose the Security question as per your convenience which can be remembered easily. Candidates should check for the given specifications for Photograph and signature so that they can easily fill the details without any errors. It will save time as well. 4kb – 30 kb) in JPG/JPEG format. State from where candidate appeared in the Qualifying Exam. Note: The candidates who have appeared in XIIth boards in 2019 need not enter their roll number at the time of registration. 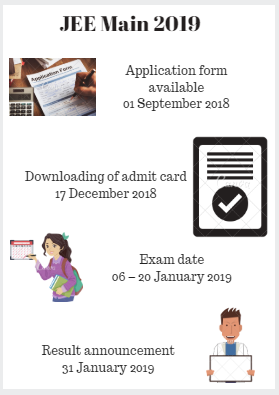 It is required at the time of Admit card download. Year of Passing Xth Standard. Year of Passing/Appearing in the Qualifying Examination. Board Name of Qualifying Examination. Roll Number of 12th Class Qualifying Exam. Percentage of Marks in XIIth. If appearing for improvement then provide XIIth class Roll Number(Passed Exam). Name of School/College from where the candidate has passed or appearing for the Qualifying Exam. Step 7. Question paper medium. Declaration by the Candidate: All the candidates need to declare that they have provided correct details. Also, they have read all the terms and conditions for JEE Main and Advanced and will follow the rules without fail. The candidates should upload the scanned B/W photograph, signature as per required format and have the exact size and dimensions. The photographs without the name and date are also acceptable. Finally, Candidates will get an Acknowledgement Page and Application Number after successful submission of all the details. And, the applicants must keep the acknowledgement slip properly for future reference. However, it should NOT be sent to JEE main authorities by post. The entire application process of JEE (Main) January 2019 is online, including uploading of scanned images, Payment of Fees and Printing of Confirmation page. Therefore, candidates are not required to send/submit any document(s) including Confirmation page to NTA through Post/Fax/ By Hand. The organising authority will open the website for limited correction once before releasing the admit card. candidates are advised to fill the form carefully. The application form correction may give limited access to form sections like uploading pictures, choice of papers, correction in the address. No options can be changed at a later stage after the submission of an application. However, a chance will be given to the candidates to correct/modify some of the particular(s) of the application form online only, with a valid reason(s) for one week after closing date. The candidates are advised to make a correction(s)/modification(s) if any during 08-14 October 2019 online only. No change will be accepted through offline mode i.e. through fax/application including e-mail etc. After filling the details in the JEE Main 2019 online application form, the candidates have to pay the required application fee. Offline Mode through e-challan generated while applying online. And, Candidates can pay the fee in cash at Syndicate/ICICI/HDFC/Canara bank branches using the E-Challan. Moreover, the CBSE the exam authority will not accept the application fee in form of Demand draft/ Money Order. And, the candidates should note that the application fee is non-refundable. Once paid it cannot be refunded under any circumstances. Download Notice on JEE Main Fees through e-Challan Here. The candidates are required to check the status of fee payment at NTA website (www.nta.jeemain.nic.in) and if the status is “OK‟ the candidate will be able to take the printout of Confirmation Page. Candidates can check the status of the fees paid at the JEE official website managed by NTA – www.nta.jeemain.nic.in. Then, upon a successful fee transaction, an Acknowledgement Page will be generated. Also, the Applicants need to take a printout of the same. Further, If the applicant has done the fee payment using credit/debit card and the status is not OK. But, in such case, the transaction failed and applicants need to make the payment again. Also, In case, of payment using E-challan, if the confirmation page is not generated then the candidate must ask the bank official to update the FEE status on the website. The number of attempts – The student can give the exam only 3 times. Age limit – For appearing in the JEE (Main) examination there is no age limit for the candidates. The candidates who have passed XII examination in 2017, 2018 or appearing in 2019 irrespective of their age can appear in JEE (Main) examination – 2019. The jee main form date is released by National Testing Agency, Furthermore, exam dates are announced on the JEE Mains website. jee main paper 1 (Online only) Engineering/B.tech. The result for Paper-II JEE Main January 2019 was released on 31 January 2019 by NTA. The final answer key for Paper-I JEE Main January 2019 was released on 23 January 2019. The result for Paper-I JEE Main January 2019 was released on 19 January 2019 by NTA. Calculate your rank for JEE Main January 2019 here. (through Credit/Debit Card/ Net Banking up to 11.50 p.m. The National Testing Agency (NTA) is a self-sustained organisation which conducts exams for higher studies. 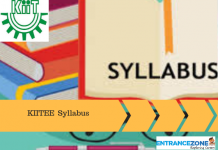 NTA will be conducting various which were conducted by CBSE including JEE Main, NEET, UGC NET, CTET, JNV so that CBSE can be relieved from the burden and can concentrate on Boards. JEE MAIN 2019 will now be conducted under the guidance of NTA. Stay tuned for JEE Main Application Form By NTA. jee main 2019 application form last date, jee main registration fee, jee main exam date 2019, jee mains 2019 registration, jee main login password, jee main 2019 centres, jeemain.nic.in 2019. What all books I can consider for JEE MAIN? Till when the forms are open for JEE MAIN? The JEE Main Online Application Form by National Testing Agency is going to be released by 1st September 2018. What are the different modes to fill the form? Can I change my Email ID in application form of JEE main? Is it mandatory to participate in both two exam of jan and april?? Thanks for every other informative website. Where else may I get that kind of information written in such an ideal way? 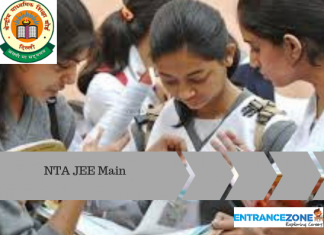 Engineering Admissions Through NTA JEE Main 2019 – B.Tech.